What is Fiction in Action: Spellbound? Spellbound focuses on extended and connected passages in one genreÂ� - the fantasy storyÂ� - familiarizing students with the language, style and literary conventions associated with this form of story. A special feature of the text is tasks that are not merely supportive of but intrinsic to the stories. Having successfully gone through these stories, students can go on to read any other appropriately leveled readers on their own. 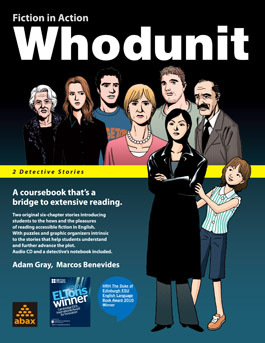 Spellbound is at about 70% of the vocabulary level of Whodunit and is for high-beginner through intermediate level students. Follow the adventures of Corwin, an apprentice wizard and son of Ulwin, wizard of the realm. Bad times are coming and Corwin's response could determine the fate of the world. As well as the text, the book includes additional listening activities in downloadable audio files as well as a wizard's spellbook which is also downloadable. Here students can note down important details and record any new words or expressions. + Quizzes! Unit quizzes are also available. If you are a teacher using this book in your classroom, please contact us through our contact page to obtain PDF files of these quizzes.